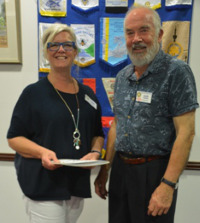 New member Andrea Preece was warmly welcomed into membership of the Rotary Club of Margaret River this week. The induction reminded us that Rotary is the world’s original service organisation with a concept for service above self. We look forward to on-going fellowship with Andrea.